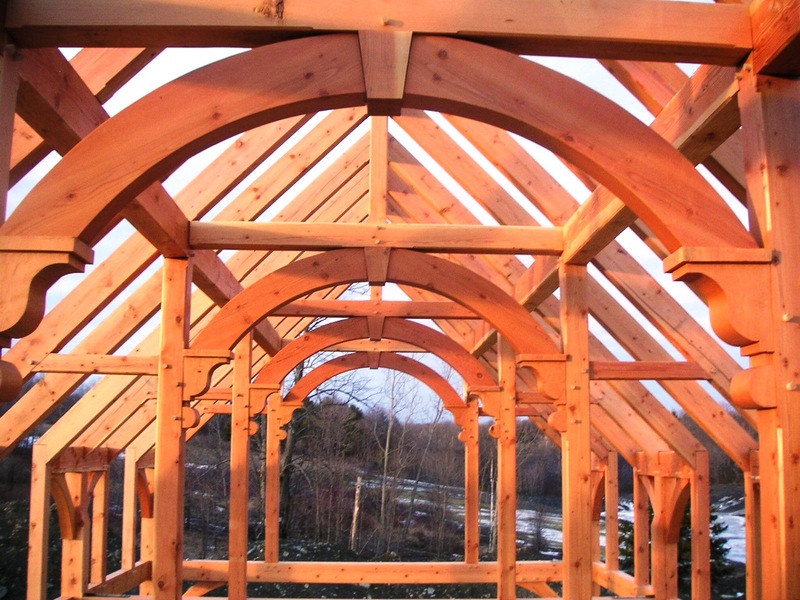 Vermont Timber Works custom designs and fabricates beautiful timber frame homes, post and beam barns, heavy timber churches, cathedral ceilings and more. We are not automated, so we have the flexibility to create structures to our clients exacting details. 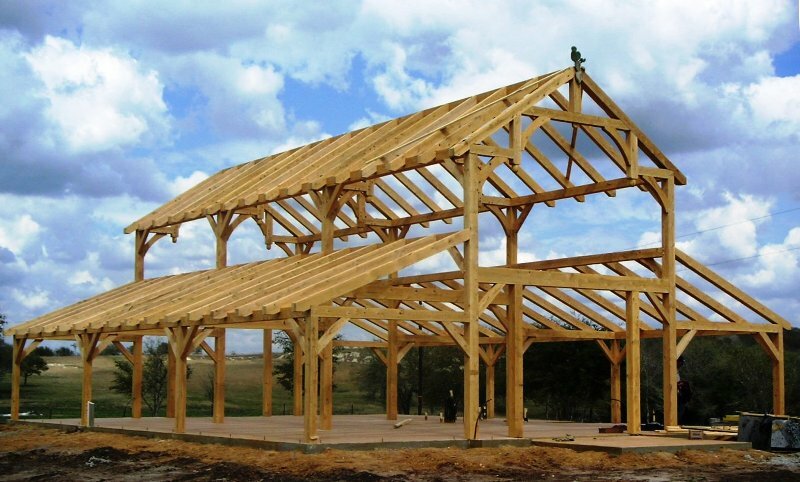 Timber framing in America is an art of craftsmanship brought by the settlers in the 1500’s. Shipwrights were the original American timber framers. 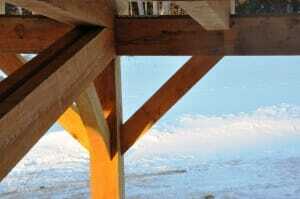 Many people still think that the roof structures of timber framed buildings look like the upside down hulls of boats. The joinery (the way the beams are held together) is quite similar – using lap joints, mortises and tenons, scarf joints, and wooden pegs. 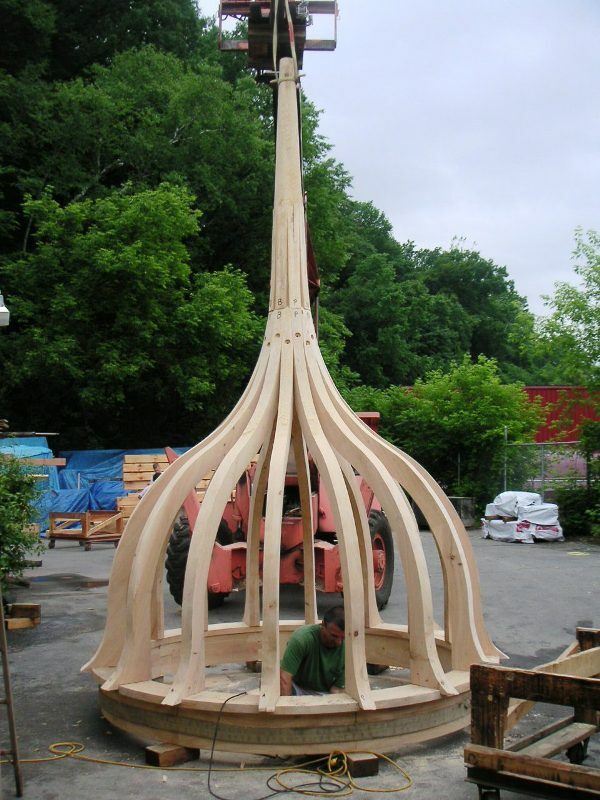 Vermont Timber Works has taken modern timber framing to a new level. We now engineer and build timber framed trusses that span eighty feet. 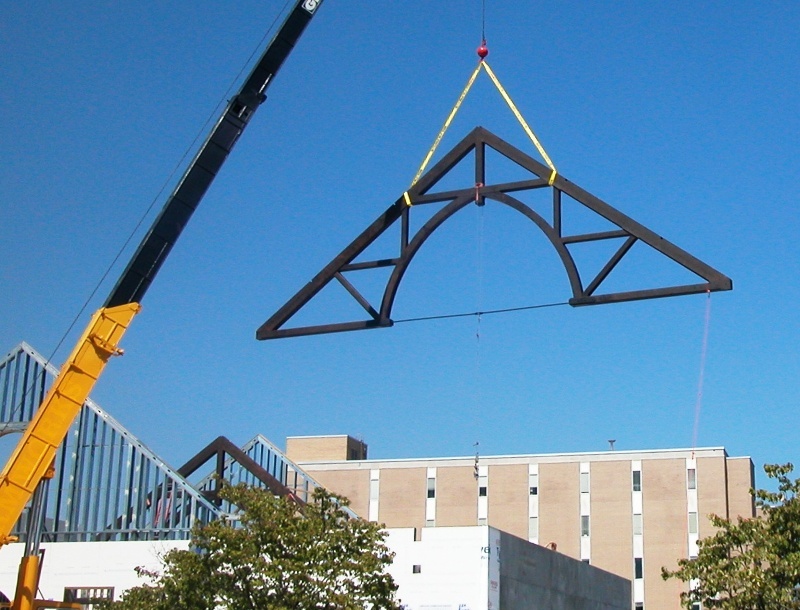 We reinforce hammer beam trusses with steel to make beautiful graceful arches. We use the old time tested methods to create beautiful wooden timber interiors for houses, hotels, churches, barns, parks, museums, and more. 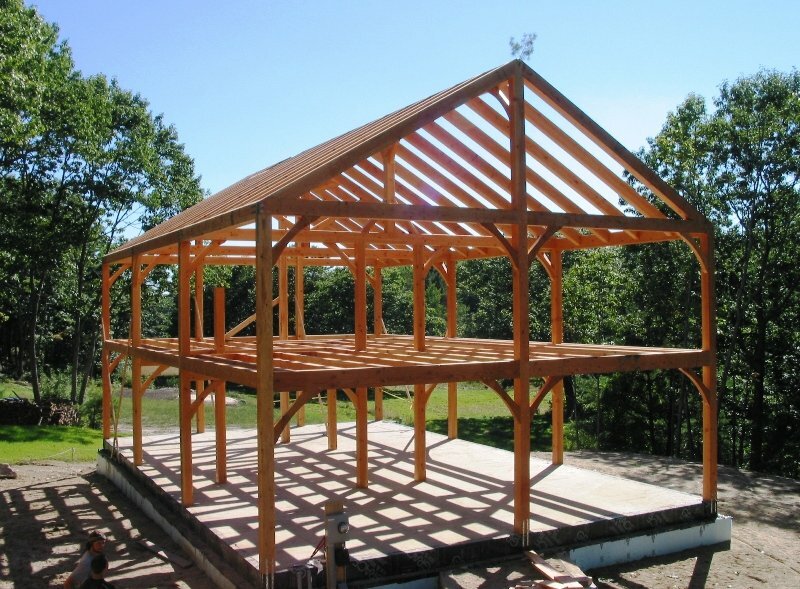 This page is dedicated to many different styles of modern timber frames. 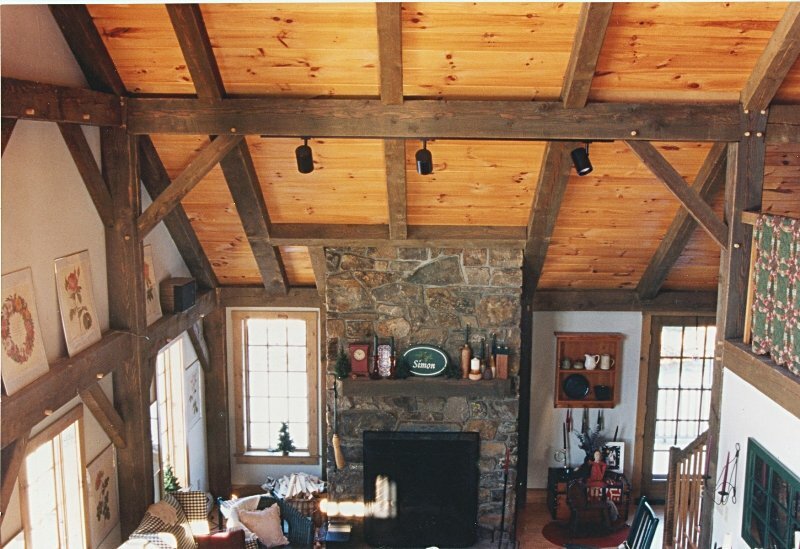 Please take some time to browse the photographs below and learn more about building with real wood beams. 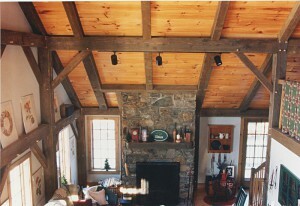 The picture shows a timber frame guest cottage for an estate in New York. 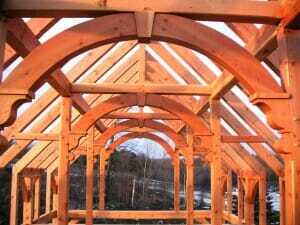 It showcases the difference between simple post and beam construction and elegant timber framed joinery. 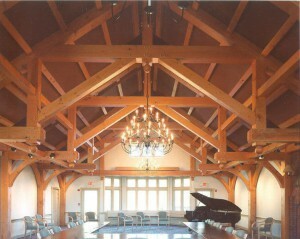 Douglas fir timber with open arched wooden beams and corbels make a beautiful wood framed ceiling. 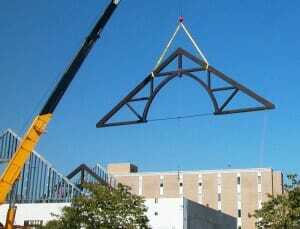 The structure of the frame is fairly simple, with a rafter plate, principal purlin, secondary rafter system, and tie design that take the structural loads. The arched beam ideas, with corbels, and key beam are mostly decorative. This barn in southern New Hampshire was made from rough sawn hemlock timber that was naturally aged in our yard. We weathered the wood by putting it out in our field for a couple of months and turning the beams weekly. The sun, wind, and rain gave the wood a beautiful barn wood look. The timber frame looks like it was built a hundred years ago. This timber entryway porte cochere was custom made for Founders Lodge on Stratton Mountain in Vermont. It has douglas fir timber columns with braces and roof plates mortised into them. 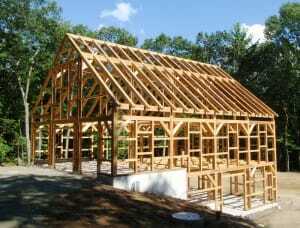 Common rafters and hip rafters make the roof framing. The open framing system works by using a tension rng design. 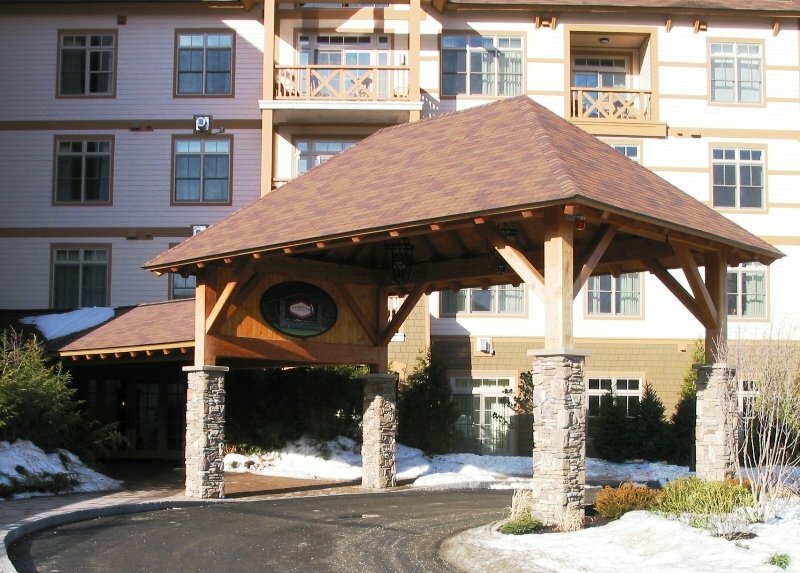 From the exterior, you can see that this porte cochere makes a lovely entrance to Founders Lodge with its huge wood columns and elegant roof framing. Visitors drive through an open timberframe when they first check in to stay at the Mountain. The main condo building is in the background. This beautiful church truss is an example of an arched truss with a steel tie rod. Most of the web members in the truss, including the graceful arches, are engineered to be in compression while the steel tie rod across the bottom is also in tension, which resolves spreading forces. The steel tie rod eliminates the need for exterior flying buttresses that were widely used in churches built in the middle ages. 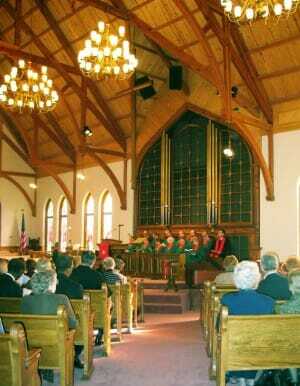 An interior view of the church with arched timber trusses. 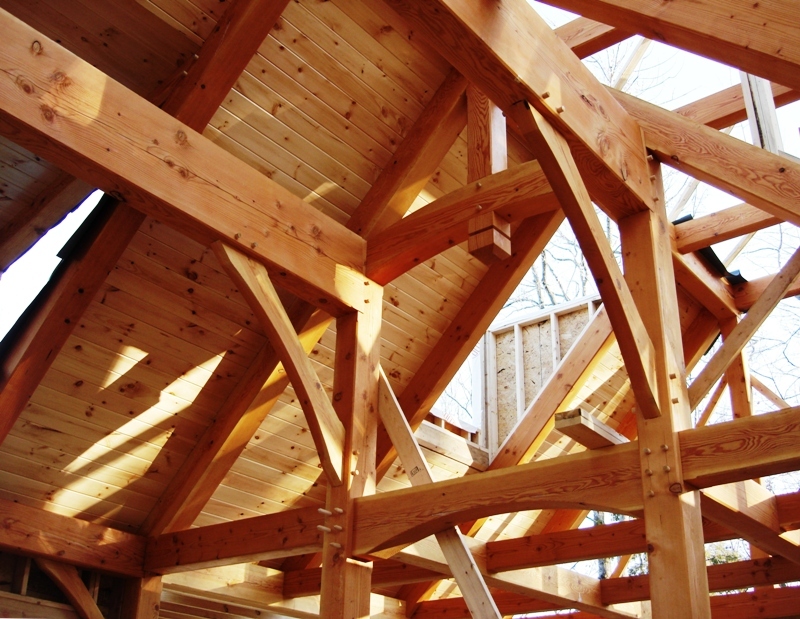 The idea for the timberframe was to keep the lines simple, graceful, and elegant. 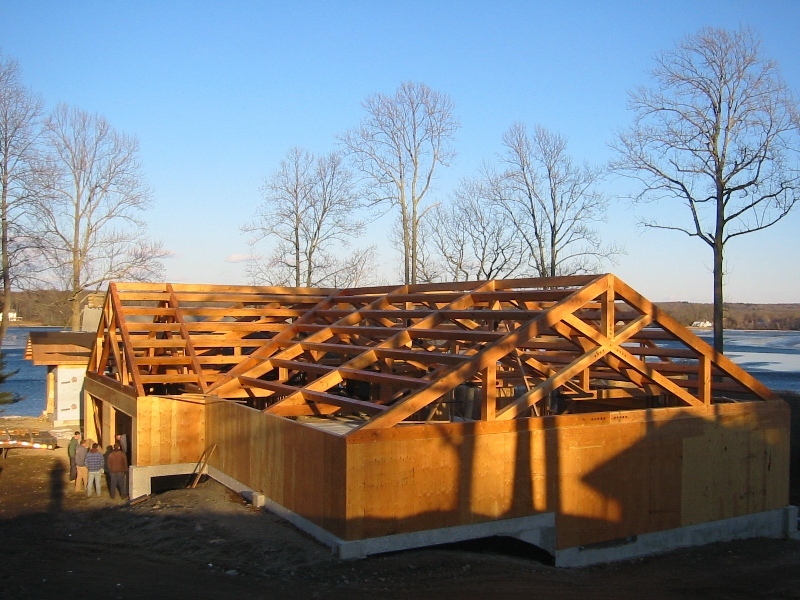 To that end, the top chords of the truss act as principal rafters and secondary purlins run between the trusses to support the roof structure. This barn was designed to be dual purpose – both for equipment and to host parties. 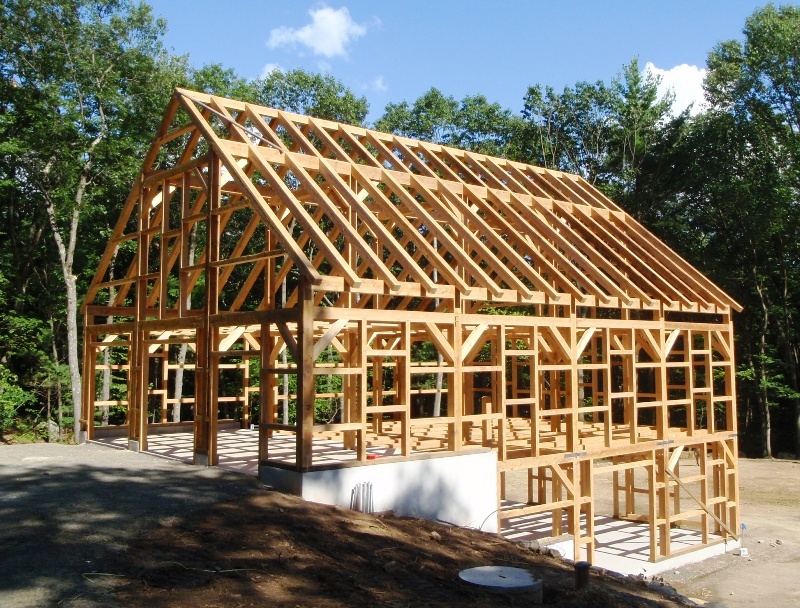 The frame has a very pretty design that combines a hammer beam bent with common rafters. It uses a principal rafter plate and ridge design. In Texas, we design and engineer primarily for wind loads rather than snow loads. The upper part of the barn is braced by the lower part, which creates and interesting and elegant design. This 80′ octagon frame is our largest span frame to date. 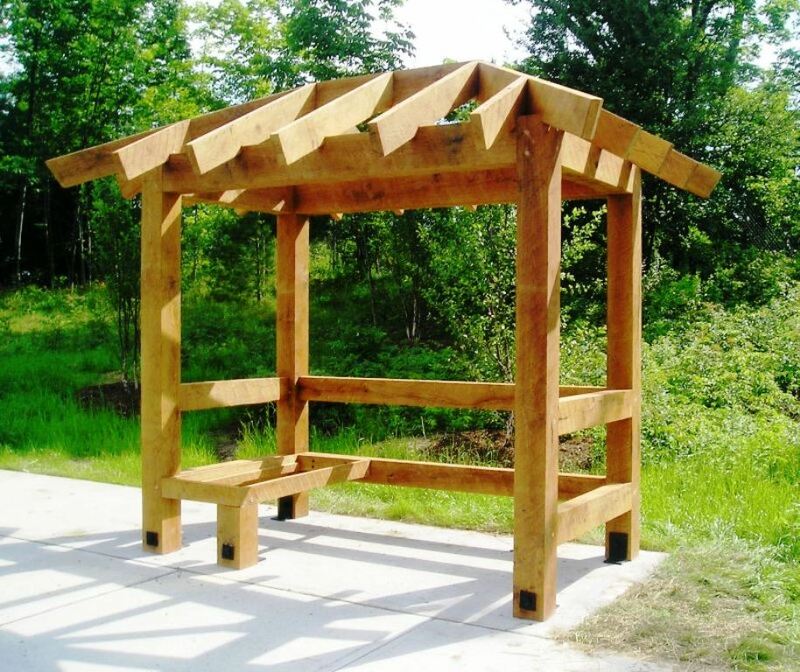 The wood and steel ski lodge frame is completely structural and uses a tension ring design with a tubular steel compression post at the top. 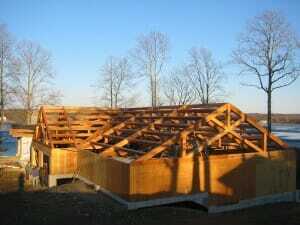 Girder trusses are slanted at the roof pitch to carry the rafters and dormers. Because of the location at the base of a ski area, the frame is engineered to support live snow loads in excess of 100 pounds per square foot. The trusses are double corded douglas fir with steel gusset plates, shear plates and 7/8” bolts that transfer the loads. 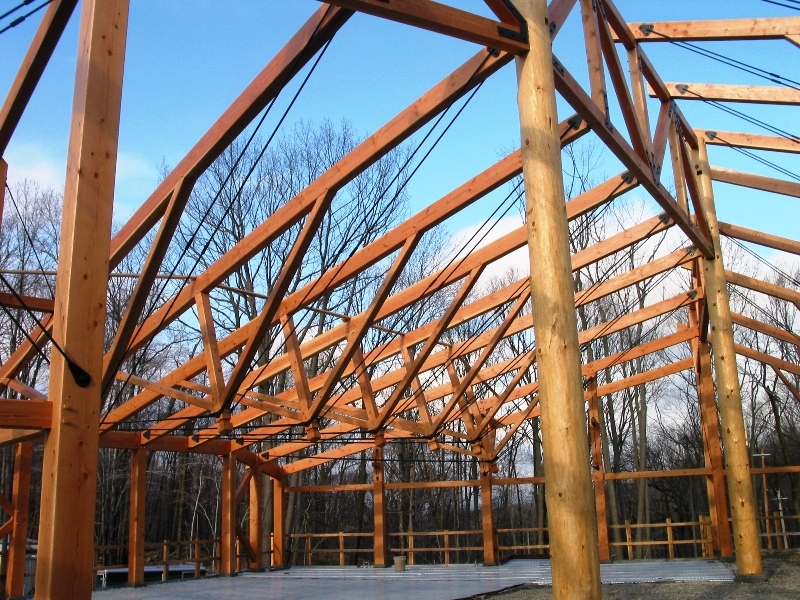 There are two sets of ring trusses – one at the perimeter and one mid-span. The dormers are also timber framed. 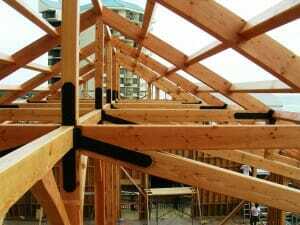 Purlins (the horizontal members between trusses) support the roof framing above. 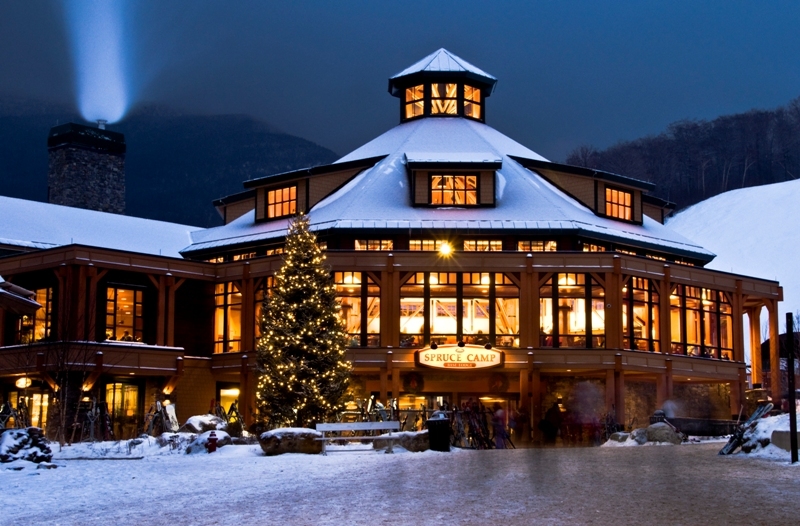 This ski lodge is one of our favorite timber buildings. It has a lovely open beam feeling. Sadly, this beautiful church, built in the 1800’s, suffered a devastating fire in 2001. 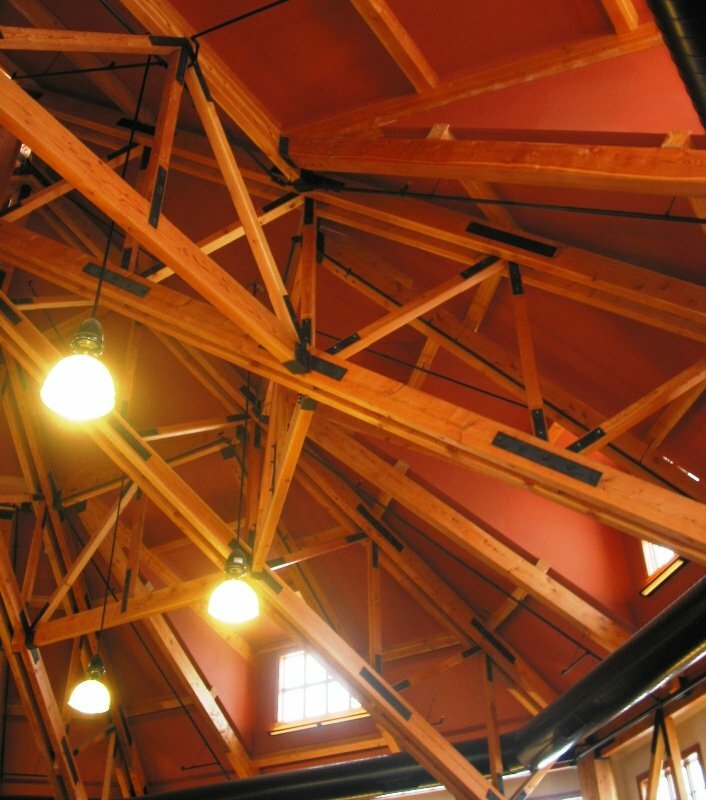 Vermont Timber Works replaced all of the church’s trusses except for the ones embedded in the outside walls, which we measured and used as patterns. Modern structural building codes required that we increase the beam sizes, but we kept the dimensions of the timber frame as close to original as possible. The result is a historically accurate reconstruction. The Double Tree Hotel in Tarrytown, NY used to be a Hilton, but was sold and renovated. The lobby was completely redone, and because of seismic building codes needed to be structurally isolated from the rest of the building. 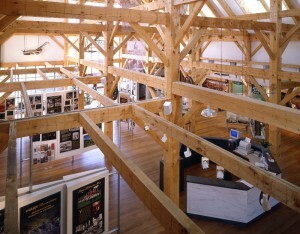 The wooden trusses, pictured to the left, are 60 feet long and are supported at two points 40 feet apart. 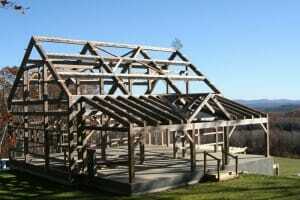 The trusses are mas with rough sawn douglas fir timber, black steel plates, and iron tie rods. 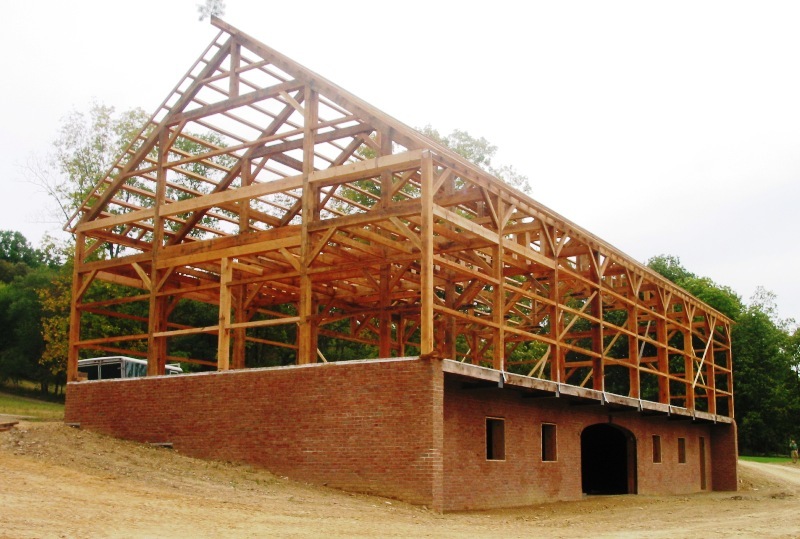 We built this beautiful timberframe house for Karl Neely, who is the primary partner in a large engineering firm. His requirements and ideas were exacting, and we were happy to help build his vacation home on a lake. He has a very competent contractor on site, so we were able to keep the installation costs down by sending a site supervisor who directed the local building crew. 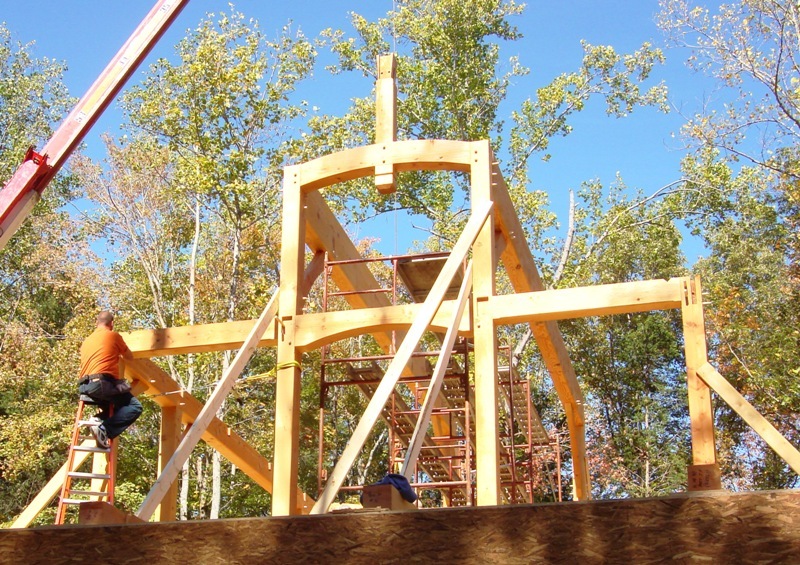 The photo to the left shows the Neely timber frame going up with a crane helping. Temporary 2x braces can be seen bracing the bents while the connecting pieces are being installed. The frame was custom designed in Vermont then shipped to Kentucky as a kit for VTW’s site supervisor and the owner’s crew to assemble. This hammer beam truss was built for the Mozart Room at the Trapp Family Lodge. 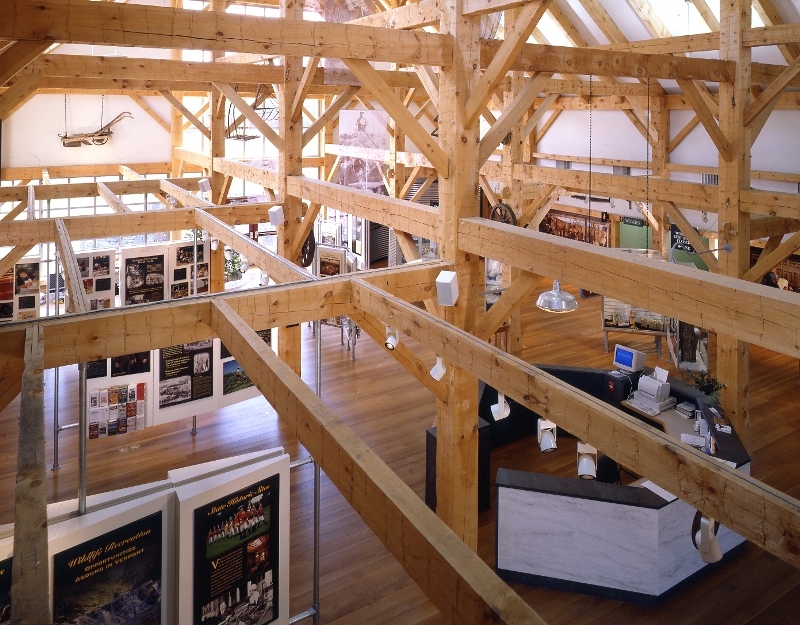 The open wood trusses are beautiful, but to structurally meet the architect’s vision they required steel reinforcing, which is hidden from view. We routed into the tops of the web members. The only visible steel are the black triangular plates at the ends of the rods. They look like decorative elements even though they are required structurally. This dining hall for the Fresh Air Fund was designed by the Geddis Partnership who we worked with along with Cuoco Engineering. As often happens, the original design came in over budget. Through value engineering, we were able to keep the architect’s original vision while reducing timberframing cost. 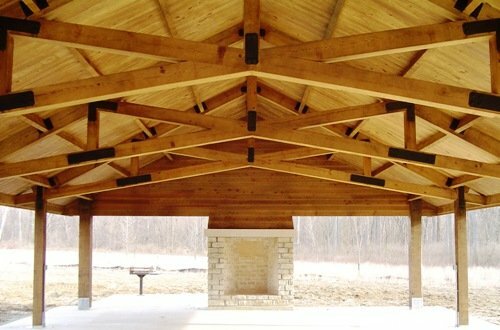 The connection details were optimized and simplified, beam sizes were reduced where possible, while keeping the huge pole barn columns. The beautiful result is pictured to the left. 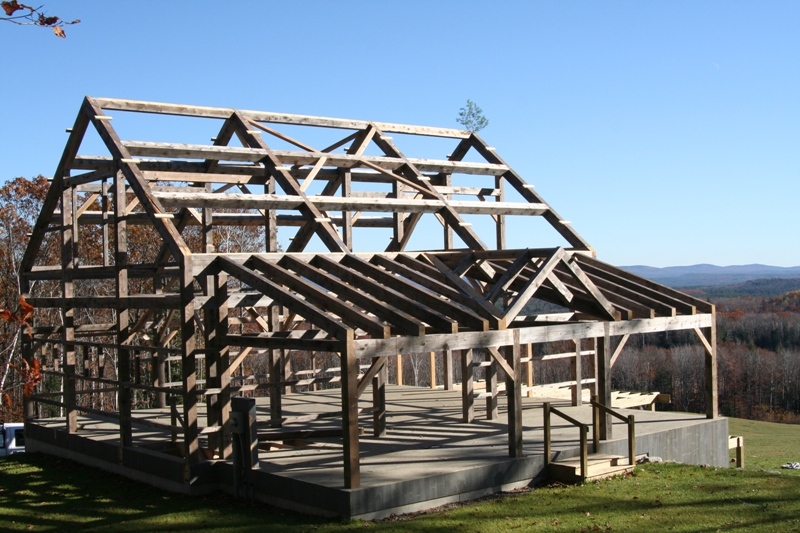 This was one of our first larger timber frames, built in 1990. It spans 40 feet by 96 feet over a large indoor swimming pool. 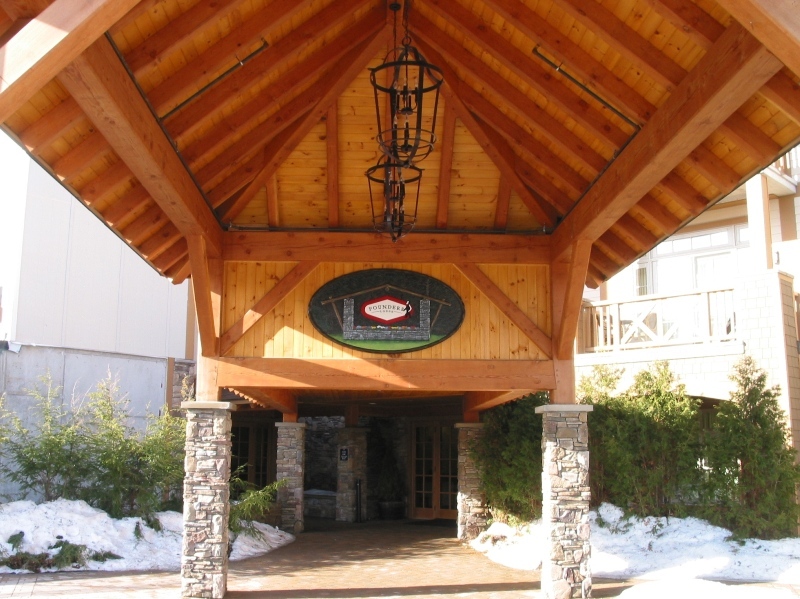 We acted as general contractors, timber framers, and designers on the building, which included a racquet ball court, locker rooms, a sauna, a conference room, a hot tub, a large cantilevered deck, sun porch, and a sun deck. We worked with Richard M. Monahon Jr., AIA Architect on these beautiful arched entryways. 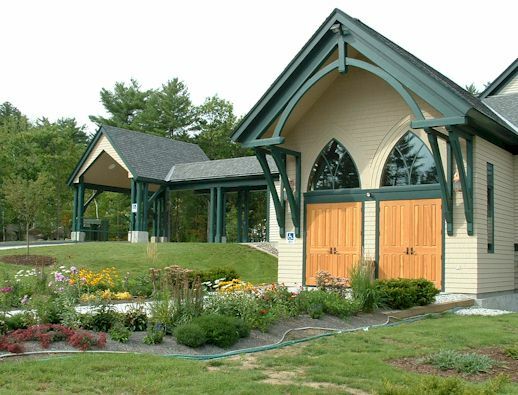 We have done many projects with Richard Monahon including, Immaculate Conception Church, Sands Barn, St Thomas Episcopal Church, Poh House, and Blackwood Barn. 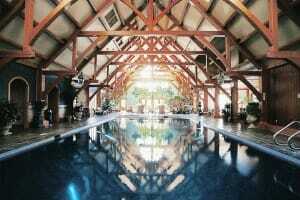 His construction and design projects range from elegant commercial buildings to simple residential post and beam homes to timber frame homes with graceful arches. We worked with Binder Ghidorzi Architectural Services on the timber frame for the House on the Lake. 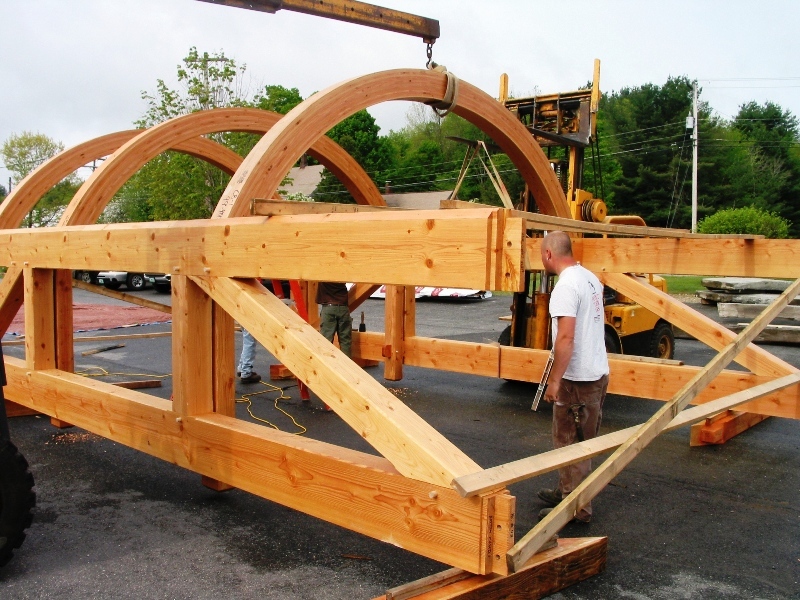 The photograph to the left shows the timber truss frame being pre-assembled in our yard prior to shipment to Wisconsin. We made sure that all the joints were fit and tight so the round ceiling beams would go together well for the contractor on site. Often, we will send a site supervisor to help with erection (when we aren’t doing it ourselves), but after the fitting of this frame we were sure that the contractor could do the site work with our help – and they did a great job. 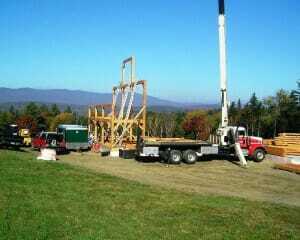 Timber frame barn being erected in Southern Vermont. This timber cupola was built in our shop in Vermont for the Presbyter Museum in the french quarter of New Orleans. The original cupola was blown off in a hurricane one hundred years ago. Ironically, Hurricane Katrina hit only a couple of month after the new cupola was installed, and fortunately it weather the storm without damage. 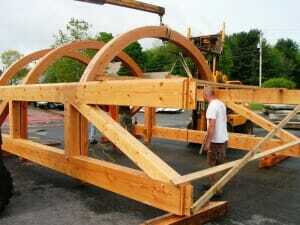 This timber frame was erected in Maine. It has a simple design, and a classic New England house was built around it. The frame features douglas fir timbers and curved braces. 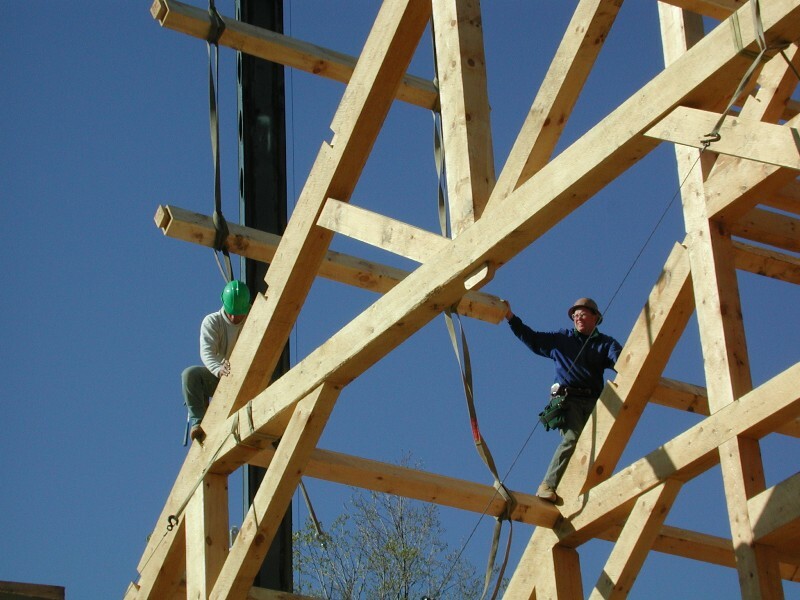 Ideas for timber frames work for all kinds of wood buildings – from the simple to the elegant. 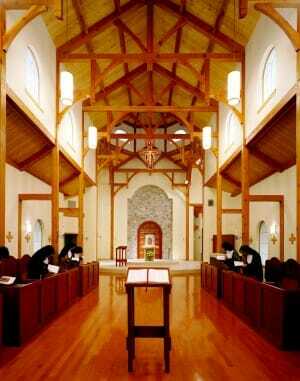 This timber framed monastery is one of our favorite projects. 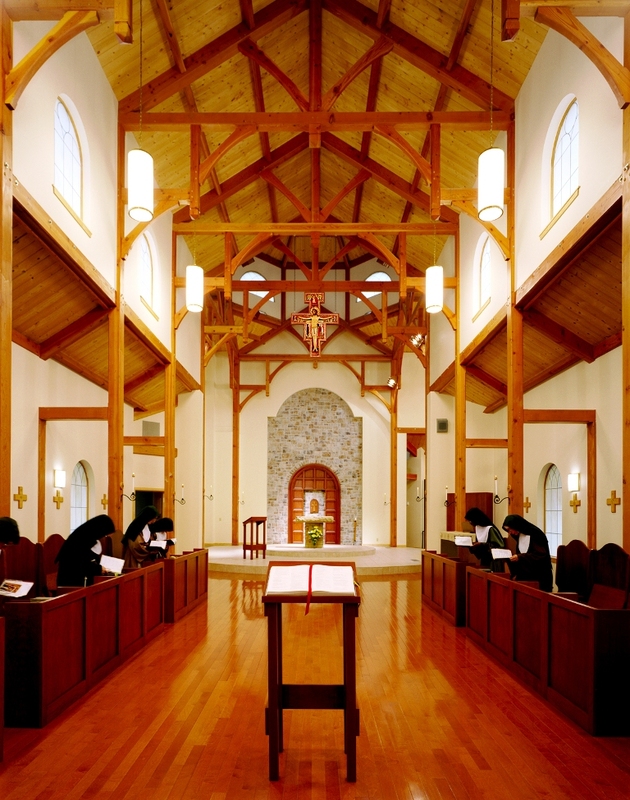 Built for the Sisters of the Poor Clares, it is a classic cathedral design in the shape of a cross with the alter in the center. Smooth douglas fir timbers and curved braces and arches add to the elegance. This project was originally over budget. We redesigned the frame and pre-engineered the wood trusses to help bring the project back into budget. The final product is a beautiful, open and airy timber frame. This horse barn was designed for a couple of horse stalls on the lower level, equipment on the main level, and storage up above. It features exposed hemlock timbers, 4x nailers for siding and common roof rafters. We built the Simon Residence in 1991 when we were still designing and building timber frame homes from start to finish – from the foundation to the final roofing and everything in between. 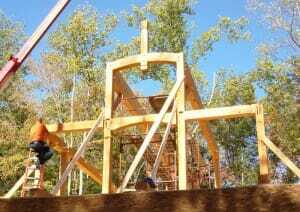 Now we focus on being timber framers, but still design with the knowledge that comes from years of building experience. 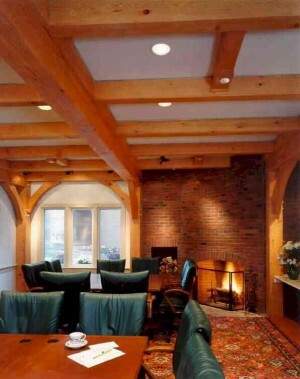 That experience helps us come up with great wood ceiling beam ideas. 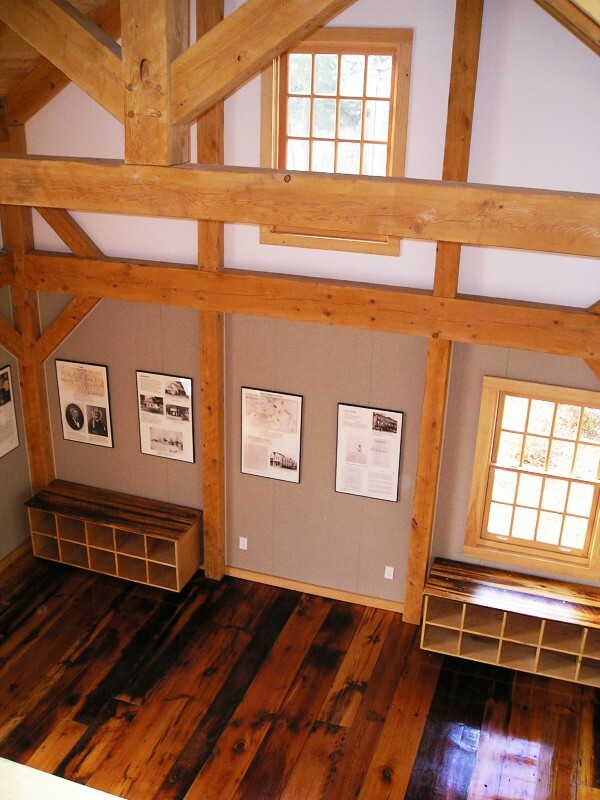 This is a great little timber frame museum on Long Island. The design is simple and rustic using exposed wood beams. 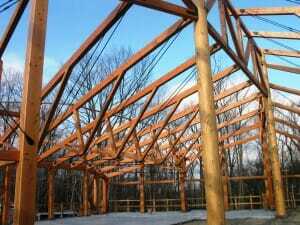 We fabricated the timber frame in Vermont and sent it and a site supervisor to Long Island to help the New York Parks Department put it up. 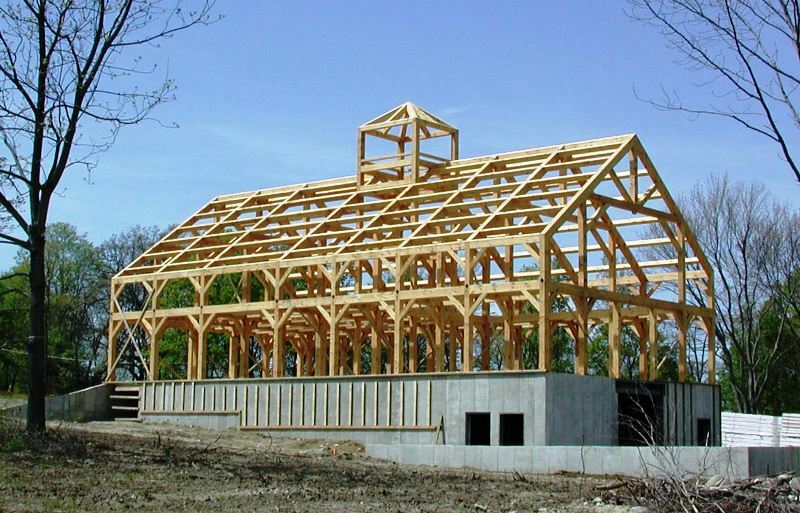 This 42’x62′ oak barn was built for farm equipment, storage and office space for the owner of the estate. It overlooks a wonderful grassy field and is in below a newly planted vineyard. This photograph shows purlins (exposed wood ceiling beams) being dropped into place on a timber framed barn. The ends of the purlins are dovetailed so they lock into place. 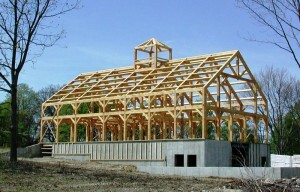 An exterior view of a timber frame barn with a large cupola. 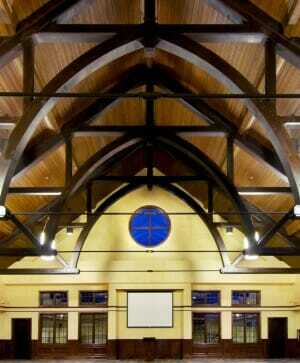 It uses massive wood beams to create a beautiful open structure. It is used as an agricultural school and an event barn. We built several picnic shelters and comfort stations in Indianapolis, IN. The picnic shelters used timber scissor trusses with steel gusset plates to form a vaulted wood beam roof system. The post bases were reinforced to take lateral wind loads with moment connections. This welcome center on Route 91 North is just over the Vermont Boarder. It features a hand hewn and rough sawn white pine and oak timbers. The joinery is traditional, and the building was designed to look like an authentic Vermont bar. 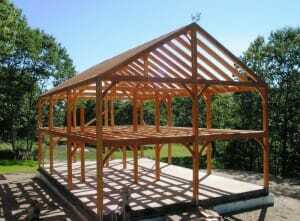 Post, tie, rafters, and exposed wood braces on a timber frame shed. This douglas fir timber frame building is on the beach in Panama City. Because of its location, it needs to be able to withstand hurricane force winds, and is reinforced with steel right down to the foundation. We did a major timber frame addition to a lodge in Stowe, VT. 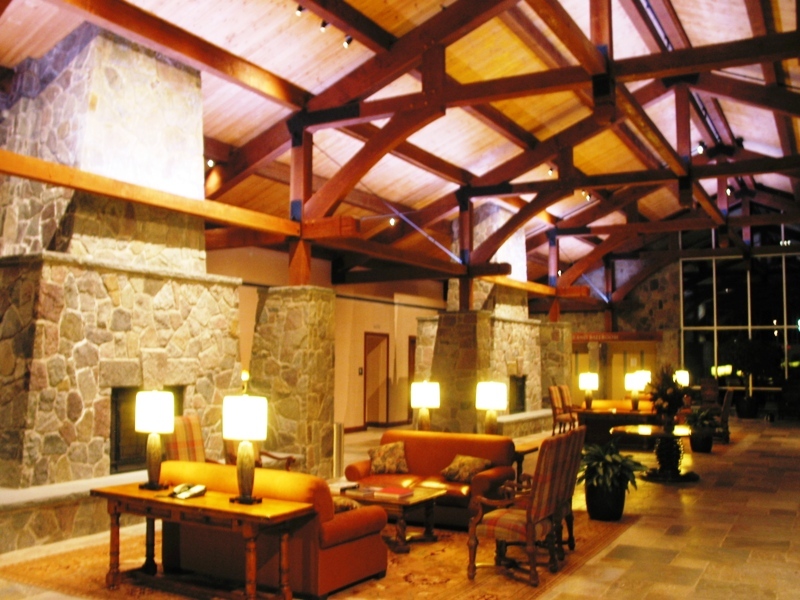 The addition included hammer beam conference rooms and three levels of wooden ceiling beams in new hotel rooms. This bus shelter was constructed for the new Park and Ride in Weathersfield, Vermont, off of Route 91. It is a simple design that is both pretty and functional, using real wood beams.